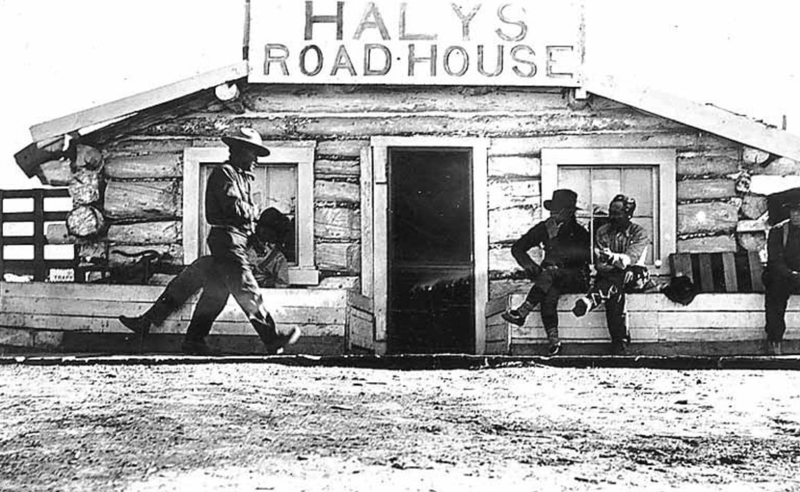 Haly’s Roadhouse, built sometime between 1900 and 1916; Jim Haly, one of the men in foreground. 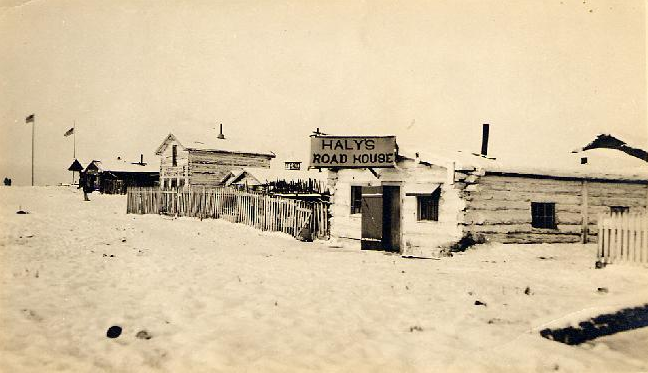 owned and operated the roadhouse from 1901 to 1918. 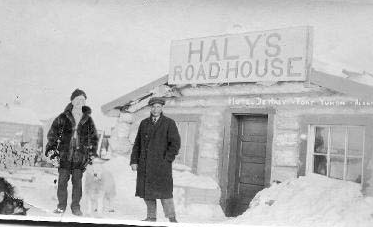 The photo on the left shows the overland party from the schooner Polar Bear at Jim Haly’s roadhouse in November,1913. The Polar Bear had been chartered to collect natural history specimens, but later also became a whaling cruise because of the high demand for baleen at the time. When the ship was caught by pack ice and forced to overwinter on the exposed coast of northern Alaska, four of the men left the ice-bound ship and traveled south with dog teams, following the Kongakut River. 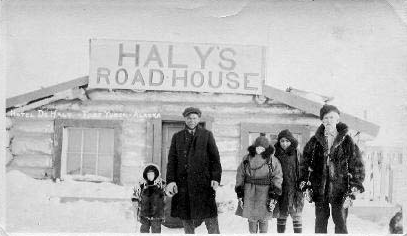 They crossed the uncharted Brooks Range, stopped at Haly’s Roadhouse on Nov. 19th, mushed on to Circle and rode on horse-drawn sledges to Fairbanks, then south to Cordova and home to Seattle in time for Christmas. 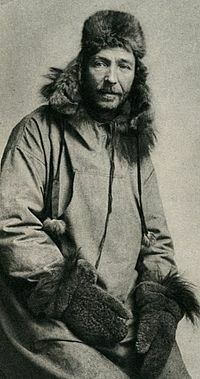 Captain Louis Lane returned to the north the following spring and met the Polar Bear at Herschell Island; the tough little schooner had come through the winter safely under the skilled handling of her crew. Fort Yukon is located on the north bank of the Yukon River at its junction with the Porcupine River, about 145 miles northeast of Fairbanks. 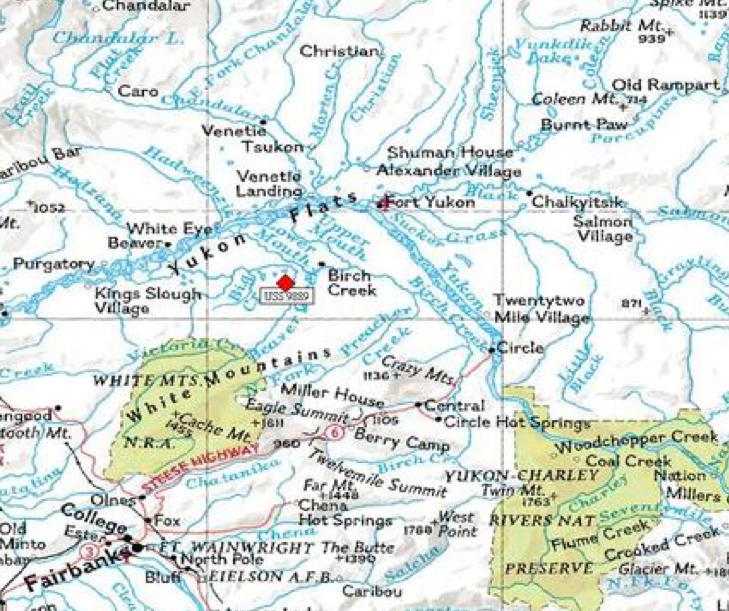 It is located eight miles north of the Arctic Circle, at the confluence of the Yukon and Porcupine Rivers, in the middle of the region known as the Yukon Flats. The highest temperature ever recorded in Alaska occurred in Fort Yukon on June 27, 1915, when it reached 100 °F, and until 1971, Ft. Yukon also held the all-time lowest temperature record at -78 °F. Alexander Hunter Murray founded a Hudson’s Bay Co. trading post near the present site of Fort Yukon in 1847 as a Canadian outpost in Russian Territory. It became an important trade center for Gwich’in Indians of the Yukon Flats and River valleys. 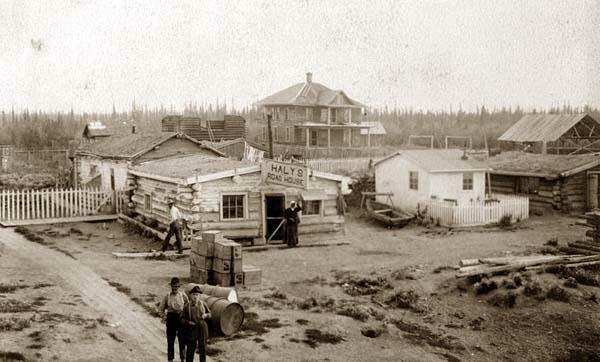 From 1846 through 1869, the Hudson Bay Co., a British trading firm, operated a trading post near the present site of Fort Yukon. A mission school was established in 1862. In 1869, two years after the purchase of Alaska from Russia, it was determined that Fort Yukon was on American soil. Large ice floes on the riverbank at Fort Yukon with Haly’s Roadhouse and Hudson Stuck Memorial Hospital in the background (1925). 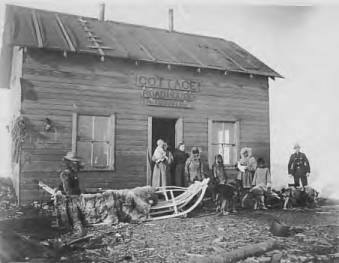 The Alaska Commercial Co. then took over operation of the Fort Yukon Trading Post. 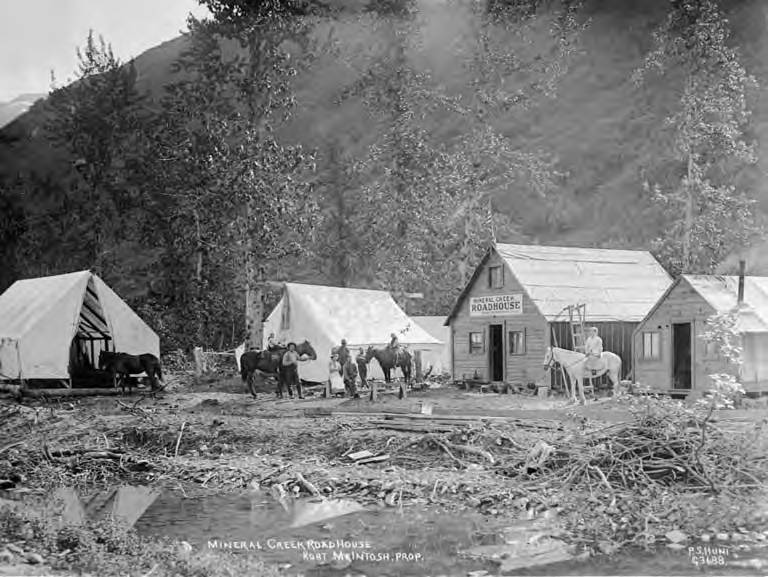 In 1897, the gold rush boosted both river traffic and the white population of Fort Yukon, while disease lowered the population of Gwich’in Athabascans. By 1898, a post office was established. 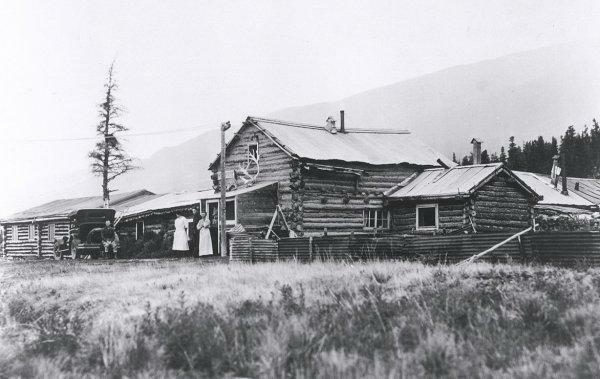 The area became a major Yukon settlement, buoyed by the fur trade, the whaling boom on the Arctic coast and the Klondike gold rush, and provided some economic opportunity for area Natives. 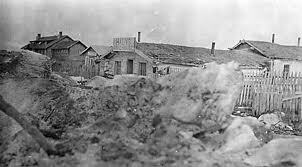 But epidemics of diseases introduced by incoming whites plagued Fort Yukon Indians from the 1860s through the 1920s. 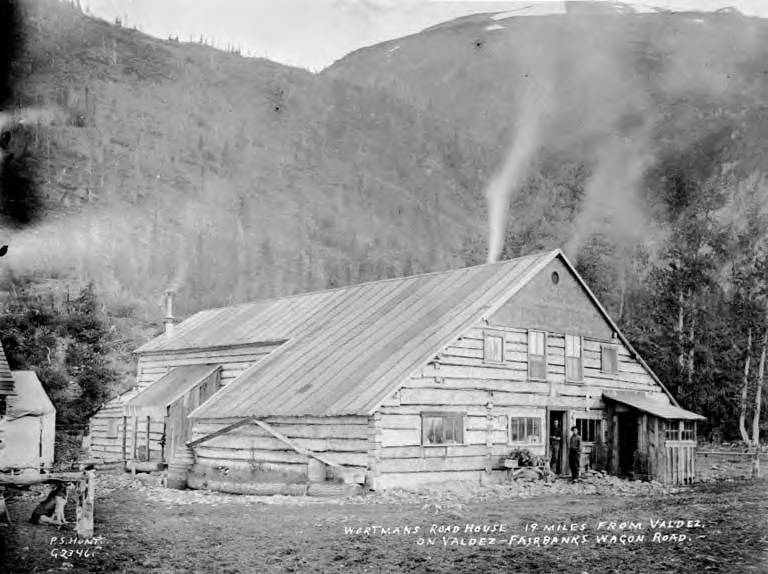 The community became headquarters for the pioneer missionary and Archdeacon of the Yukon Hudson Stuck, who, along with Walter Harper and Harry Karstens, made the first ascent of Mt. McKinley in 1913. Each winter Hudson Stuck traveled between 1,500 and 2,000 miles by dogsled to visit the missions and villages. In 1908, he acquired a shallow riverboat called The Pelican, which he used on the Yukon River and its tributaries to visit the Athabascan summer camps, where they fished and hunted. 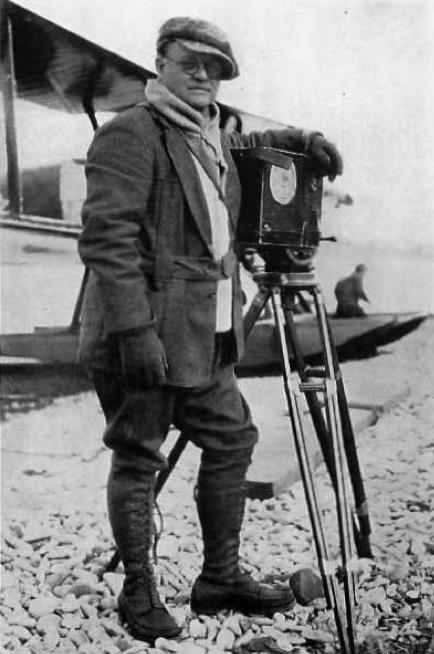 He reported that in twelve seasons’ cruises, ranging from i,800 to 5,200 miles each summer, he traveled a total of up to 30,000 miles along the rivers of Alaska. 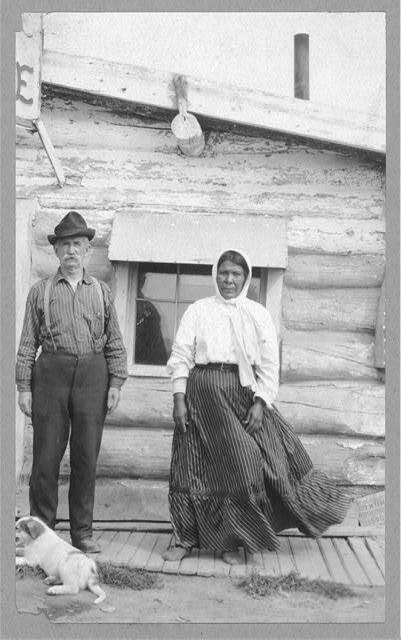 Hudson Stuck died of pneumonia at Fort Yukon in 1920, and was buried in the native cemetery there according to his wishes. 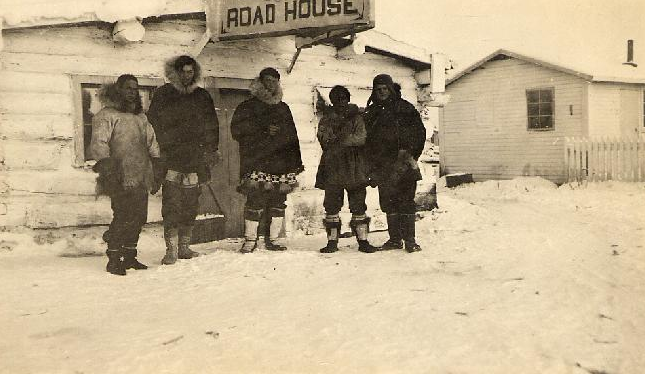 This entry was posted in Bush Roadhouses, Roadhouses and tagged Above the Arctic Circle, Alaska, Alexander Hunter Murray, Brooks Range, Captain Louis Lane, Fort Yukon, Haly's Roadhouse, Harry Karstens, Helen Hegener, Hudson Stuck, Hudson Stuck Memorial Hospital, Icy Hell, James A. Carroll, Jim Haly, Kongakut River, MacKenzie River, Mt. McKinley, Northern Light Media, Polar Bear, Porcupine River, Rat River portage, roadhouse, Walter Harper, William E. Hudson on May 23, 2015 by Helen Hegener.